Tailored Living, a garage and home storage company, participated in the annual Home Builders Association of Lexington Kentucky home improvement show. The event took place at the Kentucky Horse Park in Lexington, Kentucky from February 27th through March 1st. 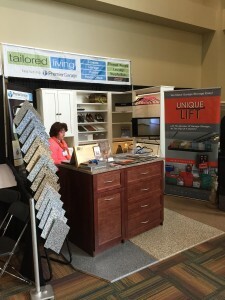 Their booth featured the Unique Lift™ garage storage solution, which allows home owners to create additional storage space from an area that was once considered useless. Tailored living recently completed a doubled installation of the Unique Lift™ in a home near Lexington, Kentucky. 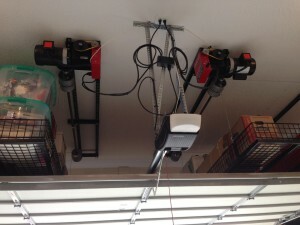 The company installed two Unique Lift™ units side-by-side above the garage door. Each unit provides up to 96 cubic feet of storage space for the home owner. Tailored Living is northern Kentucky’s premiere organizational specialist. They provide outstanding service and personalized organization solutions to fit your home and lifestyle. They are a dealer for Unique Lift™ serving the northern Kentucky region. For more information, you can visit their website. If you are interested in becoming a dealer for Unique Lift™, contact us 800-287-1014 or at mneibecker@unique1lift.com. This entry was posted in Garage Storage Ideas, Garage Storage Lift, Unique Lift News. Bookmark the permalink.